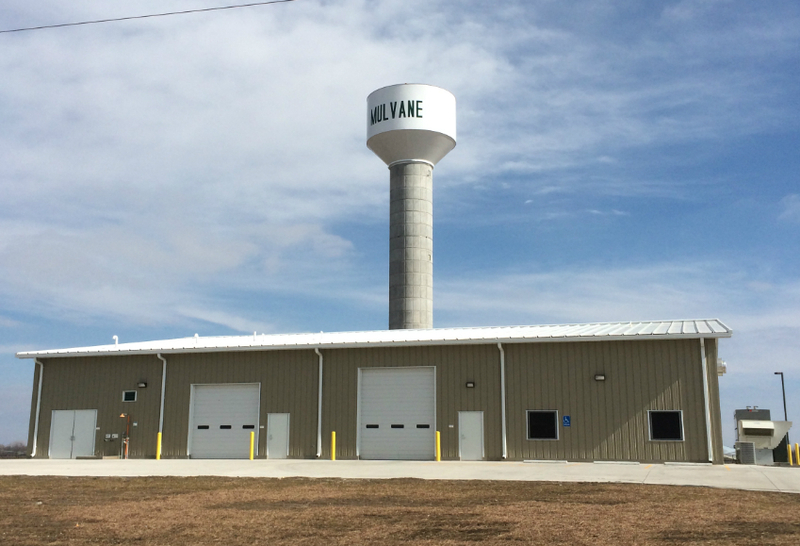 To accommodate projections for Mulvane’s increased water demand and secure a secondary source of water supply, Y&A prepared a comprehensive report on the City’s water supply, storage and treatment systems. This report included creating a water network model to evaluate and make recommendations for pipeline improvements and elevated water storage. Y&A teamed with Bailey, LLC, to examine water quality and treatment alternatives for the City’s existing groundwater well field. The resulting design memorandum, “Emergency Water Supply, Storage, and Treatment Recommendations”, provided recommendations and budget analysis for initiating the construction of a new 1.50 MGD reverse osmosis (RO) treatment plant and 0.5 MG gallon elevated water storage tank. Y&A provided all site civil and water tower design engineering, including land development and platting services. The Y&A/Bailey, LLC project team provided the process design and project development services for selecting a design/build contractor for the 1.50 MGD RO water treatment plant. Y&A provided construction administration and oversight services throughout the design and construction of the RO water treatment plant and water tower projects. Y&A has provided engineering services for a number of public entities throughout south-central and southeastern Kansas, including establishing positive and productive working relationships with State agencies and officials, City Managers, Public Works officials, Mayors and various municipal boards and commissions.